You can see in my swatch that the stitches are pretty open at the gauge called for on the ball band. © Sarah E. White, licensed to About.com, Inc. Naturally Caron Country is a lovely, easy care yarn made of a silky blend of acrylic and a bit of squishy wool. It would be a great choice for a wide variety of patterns because of its softness, strength and lovely drape. The yarn is quite pettable and enjoyable to work with and would be great to wear as well. The yarn has been discontinued as of this update, but was still widely available for sale or trade on Ravelry. 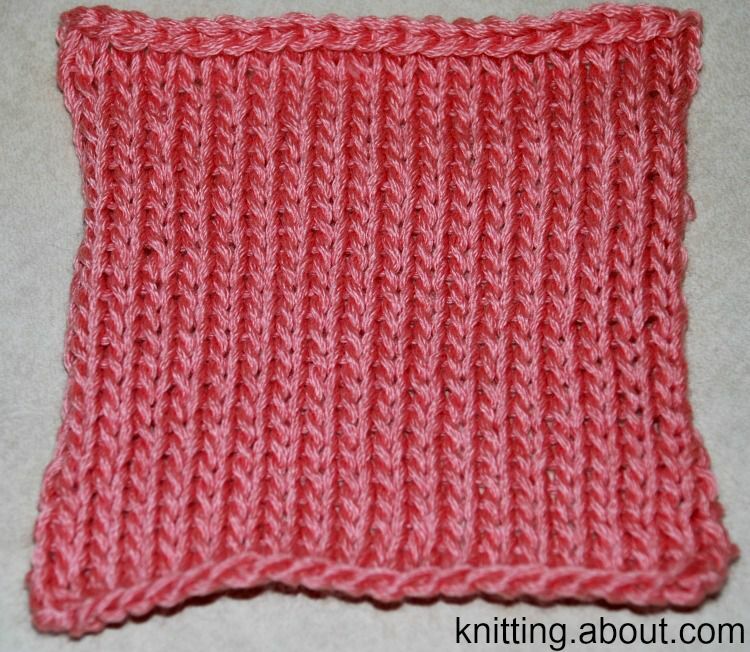 Gauge: Ball band says 16 stitches and 22 rows per 4 inches on size 9 US knitting needles; I got 16 stitches and 21 rows on size 9 needles. Care instructions: Machine wash warm, gentle cycle; machine dry low, delicate cycle. Do not iron. Naturally Caron's Country yarn is a great combination of fine acrylic yarn and merino wool that has a soft, squishy, silky feel. The stitches are very open when worked to the gauge suggested on the ball band, making for a lovely, drapey yarn with a nice sheen that would be great for summer projects as well as those more traditionally knit with wool. Indeed, it is mentioned on Ravelry that the suggested gauge given on the ball band is based on crochet stitches, not knitting, and that many knitters like to think of the yarn as a DK or light worsted weight (thereby using smaller needles) rather than a worsted or Aran weight. The yarn is easy to work with, with just a bit of splitting (I used rather dull-tipped bamboo needles). The ball band describes the yarn's construction as a 12-ply cable, which it says provides superior 3-D stitches, shape control and softness. I agree with all of that. Stitches are relatively even and sharply defined; I'd love to knit cables with this yarn. My Stockinette Stitch swatch curled considerably vertically, but the woolly content of the yarn helped to flatten it out pretty nicely after blocking. Caron Country would be a lovely choice for a wide variety of projects. I'd like it for simple sweaters for kids and adults, as well as shawls and wraps. The machine washability of this yarn makes it more versatile for a variety of projects that need to be easy to care for, without feeling like it's an easy-care yarn. The colors have a lot of variety in the pink-red and blue-green ranges, making them clear choices for baby projects as well. Textured knitting and colorwork wouldn't be a bad idea, either. Checking out the projects made with the yarn on Ravelry, I see lots of hats (including a Baa-ble), sweaters, tops and some shawls as well, which is also a great idea. I made an eyelet wrap with Caron Spa, which is a similar yarn. While this yarn is no longer widely available, if you have some in your stash or have a chance to buy some, it's worth it. This yarn is a great choice for people who want a soft, silky, easy to work with, easy to wear and easy to care for yarn that can be used for a variety of projects. It's certainly worth checking out.